Well stimulation is commonly applied to boost oil or gas production and, consequently, revenues therefrom. Stimulation is nowadays commonly associated with hydraulic fracturing, but a number of other techniques have been used in the past and are still applied today. It is essential to get an insight into them in order to understand the origin of techniques used for extraction of unconventional hydrocarbons. well productivity decreases in the third stage and cannot be offset by drilling more wells. At that point in well history stimulation procedures have to be applied in order to enhance well productivity by removing natural and drilling-induced barriers to the flow of hydrocarbons. Unlike enhanced oil recovery techniques, well stimulation has no effect on reservoir pressure. by lowering viscosity of the crude oil. Technologies that are used today reach way beyond the immediate vicinity of the well bore and the so-called “skin damage” area, as it had been the case in early history of oil production. The improvements were driven by the oil crisis of the 1970's in an effort to enhance recovery from indigenous oilfields, then considered as commercially non-viable, following OPEC's decision to increase dramatically the price of their crude product. Stimulation techniques were further improved in the 1990's with focus on reservoirs of medium to high permeabilities. Nowadays, oil and gas companies are in disposal of a wide array of stimulation solutions that have been developed in the past 150 years with good oilfield management in mind. Explosives were first used for enhancing oil flow to the borehole as early as in the 19th century. In 1865, E. A. L. Roberts used 8 pounds of black powder in “Ladies Well”. This marked the beginning of the well shooting era. In addition to powder, subsequently discovered nitroglycerine and dynamite were used. resistance to the action of hydrocarbons and water in the borehole. Explosives were placed in rigid (sheet metal) or flexible (hemp warp, sail-cloth) containers called torpedoes. This method had been increasingly popular before the advent of the much more efficient and safer hydraulic fracturing in the 1940's. Poland saw the first well shooting attempts in the interwar period, but most of them were unsuccessful. After WW2, approx. 900 well shooting jobs were effected from 1945 to 1957, mostly in the Carpathian Mountains. This technique was no longer used in the 1960's. The last well shooting job worldwide took place in Pennsylvania in 1990. Nowadays, well shooting is used exclusively for fishing purposes (to remove obstacles from the well bore). This is due to the way of explosive action in the borehole. Torpedo acts in two ways – mechanically and thermally. The former one crushes the near-well zone so as to induce a network of fractures and fissures through which reservoir fluids may flow to the borehole. However, the range of explosion impact is usually small and does not exceed 10 metres. Heat is the second way of action. Paraffin wax, asphalt, etc. deposits in the formation pores often impede the flow of crude oil to the borehole. The heat from torpedo blasting dissolves the deposits and reopens migration channels. Nonetheless, well shooting has several inherent flaws. First, the explosion prevents any subsequent drilling operations, as blast-compacted rock is impenetrable to normally used drilling tools. This may completely block the flow of crude oil to the borehole. Heat generated by torpedo explosion may have a similar effect, if the temperature is exceedingly high. Formation walls may get melted, closing the pores with resulting decrease in oil production rate. 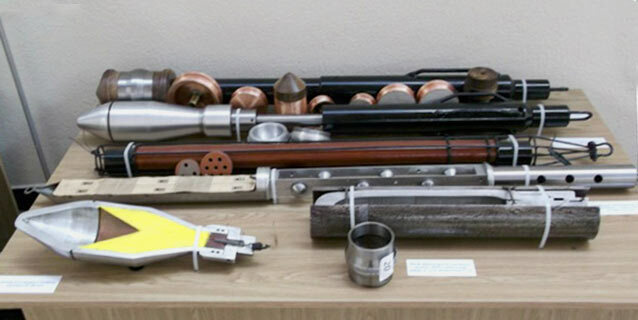 Due to all these deficiencies, well blasting is no longer applied in the oil and gas industry, it was superseded by more efficient techniques. Nevertheless, it is important to have an idea of well shooting in order to understand the origin of contemporary techniques, such as cumulative perforation, powder pressure generators or hydraulic fracturing. The so-called cumulative perforation marked the next step in the development of oil and gas well stimulation. Having noticed that well shooting is low effective and its course is hardly predictable, in 1930's oilfield engineers attempted to improve process predictability by making the explosion directional. At first, mortar shells were used, but to poor effect. The second World War and a significant progress in cumulative charge technology meant a breakthrough for the application of explosives in oilfields. The new technique was first used on a commercial basis in California oilfields in 1946. 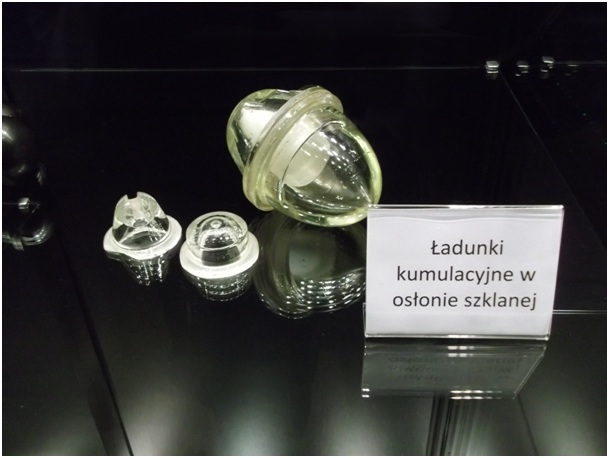 In Poland, initial tests were performed in the 1950's and the method was generally adopted soon thereafter. Cumulative perforation was initially intended to enable access to the reservoir by perforating the borehole walls. It was only some time later that oilfield engineers noticed well productivity enhancements following the procedure. This is due to the fact that the rocks surrounding the well are perforated along with casing pipes. The mechanism is similar to the well shooting, but it is much more efficient, insofar as a network of radially propagated fractures is induced around the point of perforation, rather than a compacted rock mass that prevents the flow of hydrocarbons. Moreover, the range of these fractures is much longer than that produced by well shooting. Cumulative charges are placed in special units (guns) that are lowered to a vertical well using a shot cable. In case of directional and horizontal wells, perforators are lowered on drillstem or on tubing (Tubing Conveyed Perforation) or using the so-called PCP, i.e. permanent completion perforating. This method is much more time- and labour-intensive comparing with now increasingly popular coiled tubing, but more expensive. Moreover, the perforators' parameters have to be adjusted to downhole pressure and temperature conditions, as well as to the presence of drilling fluids at the target perforation depth. 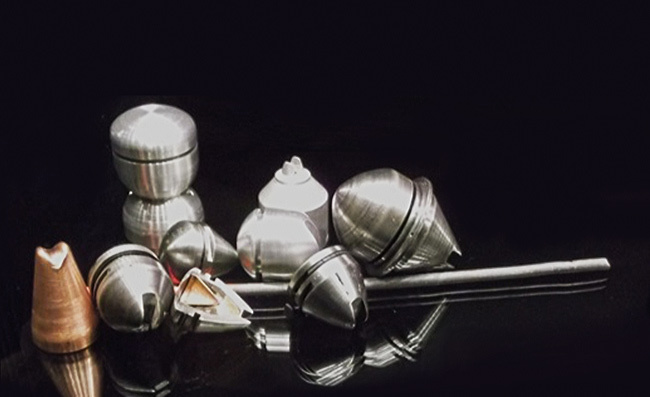 Therefore, perforators intended for use at greater depths are placed in sealed containers, whilst charges that are to be fired nearer the surface are placed directly in the guns and lowered on a steel tape. Powder pressure generators are frequently in the form of a tubular compacted rod. Cumulative perforation is still being perfected and commonly applied in exploration for mineral waters, geothermal waters and sulfur. It is frequently the first step preceding such jobs as hydraulic fracturing, acidizing or the application of powder pressure generators. Fracturing with powder pressure generators is a further development of the casing and near-well zone perforation method. Explosives that release energy longer than those applied in well shooting are used to induce a much wider network of fractures. Explosives used in powder pressure generators are the so-called propellants, i.e. solid (powder) fuels that deflagrate rather than explode and release large amounts of gas. An irregular network of short fractures is formed to facilitate the flow gas to the borehole. Comparing with hydraulic fracturing, lower cost and minimum requirements for specialty equipment are the advantage of this method. Hydraulic fracturing is currently the most commonly used production stimulation technique. Its history started in the USA in the 1940's. In 1947, the first fracturing job using napalm-thickened gasoline was made in Kansas. Fracturing fluid with sand was used two years later. Initially, oil-based fracturing fluids were applied. 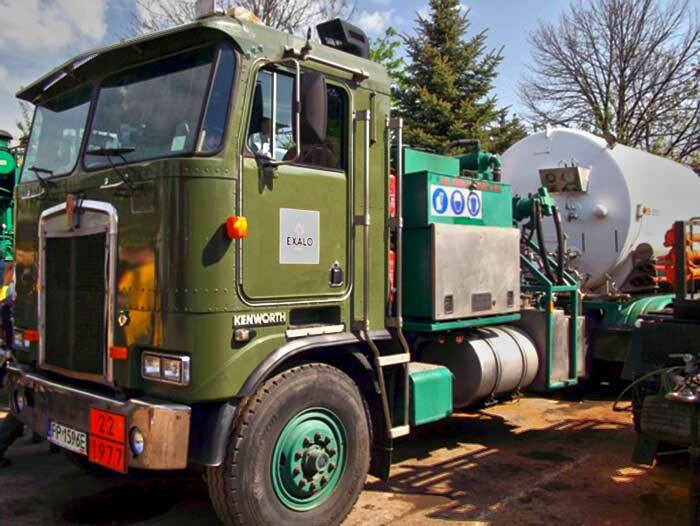 Water has been the first choice at fracturing fluid formulation since the 1960's. Hydraulic fracturing has been used for shale oil and gas production since 1988. Its application in horizontal wells boosted production efficiency by extending the range of effects on oil and gas accumulations. The so-called “shale revolution”, which made USA the top natural gas producer worldwide, enabled to refine the process and bring the cost down. Fracturing was introduced in Poland in 1956-57, mainly in the Carpathian Foothills Region. At first, the effects proved to be unsatisfactory, as most of the wells were percussion drilled with non-cemented casing. The necessity to protect the wells meant additional costs with adverse effects on fracturing efficiency. The 1970's saw a great progress in fracturing technology with the advent of natural and synthetic polymers as fracturing fluid components easily accommodating the fluid to various downhole conditions. However, the cost of fracturing is so high that well productivity must be at least doubled in order for the operation to be economically viable. Like in the case of well shooting and powder pressure generators, the process is intended to induce a network of fractures that enhance permeability of the reservoir rock. The key difference is much longer time of rock mass exposure to high pressure and, consequently, a much wider range of the fractures. Fracturing mechanism first involves fluid injection to the well to induce fractures, followed by injection of the fluid carrying a proppant material. At that time the well is closed with a high pressure wellhead. Subsequently, flowback water and reservoir fluids are recovered from the well. Network polymers meet most of these requirements. 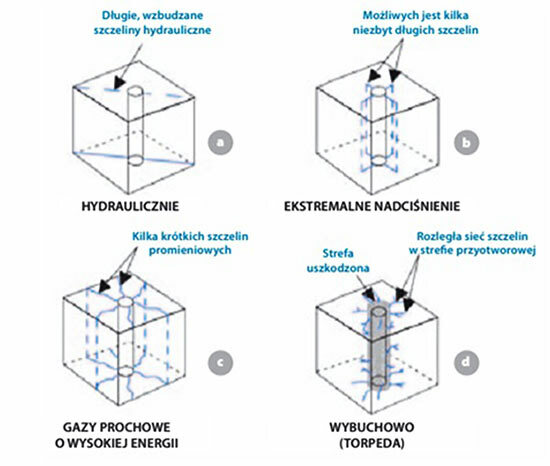 Fracturing fluid is usually composed of water (95%), proppant (4.5%) and chemical additives (0.5%), although the parameters are frequently changed during a single job so as to optimize the process. The application of proppant and chemical components makes hydraulic fracturing apart from other pressure-based stimulation procedures. Proppant fills the induced fractures to prevent them from collapsing and helps to keep the reservoir fluid flowing to the well bore over long time. Early in the history of fracturing riverbed sand was used as proppant but with mixed success due to its non-homogeneity and variability of parameters. Therefore, better proppants have been sought in the past fifty years. Ideally, proppant should be resistant to squeezing, chemically neutral, homogenous and available at a low cost, considering huge amounts needed for a single job. Tested materials included: nut shells, aluminum, glass and plastic beads. None of them was economically viable. Today, well sorted natural sand or ceramic materials are commonly used as proppant. buffers to control pH (mostly acids). Since recently, environmental organizations have increasingly contested hydraulic fracturing for shale gas production, although the aforementioned substances are commonly used in households. The protests started a few years ago, but fracturing jobs have been performed since more than fifty years. Hydraulic fracturing may seem the most efficient stimulation technique, but it should be emphasized that its scope of application is limited to non-plastic rocks such as sandstones, dolomite, limestone, whilst sandy, clayey or loamy formations are not suitable for hydraulic fracturing. The main downside of hydraulic fracturing is the cost. In case of horizontal well fracturing the cost is equal to approx. USD 1.5 – 2.5 million (about 25% of the total well drilling cost) in the United States. Cost items include such facilities as manifold, pump sets, blender, sand conveyors, etc., as well as fracturing fluid (160 m3 on average) and proppant (30 tonnes). Procedures other than standard hydraulic fracturing include: multiple fracturing (to expand the range) combined with well shooting (that helps to minimize pumping requirements), use of implosion or liquid carbon dioxide and nitrogen. The latter technique is particularly interesting as, comparing to the standard job, it offers a better effectiveness at depleted reservoir pressures, if problem of migrating rock particles is encountered, as well as in coal beds. Liquid CO2 and N2 should be applied wherever the risk of fracturing fluid reaction with clay is present. Moreover, an additional advantage of this technique is that it helps to increase the rate of fracturing fluid recovery from the reservoir. Liquid carbon dioxide has been used since the 1980's, mostly in Canada (more than 1200 treatments in the years 1981- 1995). The “shale revolution” prompted the application of this technique to the production of unconventional hydrocarbons, albeit solely from shallower and low-energy accumulations. Besides techniques that have physical effects on the reservoir rocks, chemical methods are available, of which acidizing of the near-well zone is most commonly applied. Like other aforementioned techniques, well acidizing was invented in the late 19th century. The idea behind the invention was to take advantage of the dissolving effect of hydrochloric acid (HCl) on carbonate reservoir rocks. Initially, corrosion attack on the pipes was the key problem that oilfield engineers were unable to cope with. The 1930's saw a heyday of that technique following the application of corrosion inhibitors that permitted multiple acid treatments. 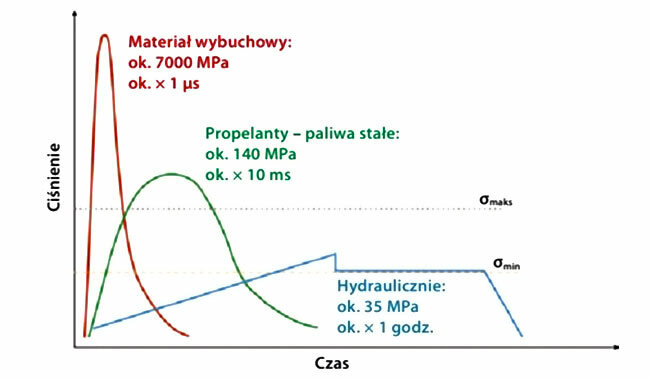 In Poland, a method of Jurassic limestone acidizing was developed and tested in the 1950's, and since then has been successfully applied elsewhere. Technically, acidization involves injection of an acid-containing substance to the well in order to expand fractures and pores in the near-well zone or to remove damage caused by clay swelling. This technique may only be used in carbonate rocks (dolomite, limestone) or if the rock matrix is calcareous. Most frequently used inorganic acids are: hydrochloric acid at concentrations of 7-15% and hydrofluoric acid; organic acids include acetic and formic acids. The former are more corrosive and react quicker and more actively than the latter ones. Accordingly, mixtures of organic and inorganic acids are used. Other acidizing fluids include: dry ice, hydrophobic emulsions and foam, but the mechanism of the reaction is similar. Reaction of acid with a calcareous rock produces water and carbon dioxide, but frequently other undesirable products are deposited in the pores or on production equipment and damage the latter. In order to protect the integrity of the well various chemical substances are introduced: corrosion inhibitors (formalin, sulfur and nitrogen compounds); stabilizers that prevent precipitation of reaction products from the solution (acetic acid); anti-emulsifying agents that prevent formation of water- and acid-oil emulsion that impede the flow of crude oil; and reaction retardants to enable deeper penetration of the fluid. Well bottom cleanup from any loose material and injection of working fluid (e.g. crude oil) is the first step of acid treatment. Subsequently, acidizing fluid is injected until working fluid is recovered and then the wellhead annulus valve is closed. In the next stage, acidizing fluid is injected into the reservoir, the well is closed for a time required by acid reaction with reservoir rocks (for a few to several dozens of hours). Eventually, the well is cleaned from reaction products before resuming extraction. Acidizing fluid composition is selected on a case by case basis depending on reservoir pressure. Acid treatment may be delivered on an uncontrolled basis, i.e. in the entire reservoir, or selectively – if the acid is injected into specific layer or reservoir zone of a lower permeability. The latter approach involves the use of packers or flexible Coiled Tubing to isolate specific sections of the borehole. Alternatively, blocking agents are used to block larger pores so as to enlarge the smaller ones. Acid treatment is sometimes combined with hydraulic fracturing. In that case proppant is no longer necessary, as the acid sufficiently widens the induced fractures. Acid treatment significantly improves fracturing effectiveness, but its application is limited to calcium carbonate-containing rocks. Acid treatment is also applied in places where fracturing would be ineffective, for example if folded geological structures are present. This is the case of Monterrey shale gas formation (California) where the application of this technique is envisaged, should the planned moratorium on shale gas production be not adopted. Thermal methods, called heat flooding, which involve reservoir rock heating in order to decrease oil viscosity, are the final group of well stimulation techniques. Basically, they are used in heavy oil reservoirs that contain a high share of the paraffin ends. Heat flooding of oil wells may be done using several methods: with chemicals, electricity, steam, electromagnetically or in situ combustion. The former of the aforementioned methods is based on exothermic chemical reactions, for example of magnesium or a nitrogen base with hydrochloric acid. The chemical method is frequently combined with acid treatment, as similar substances are used in these techniques. Lowering electric heater on a wireline or on tubing into the well is another heat flooding technique. The desired temperature should enable paraffin melting, but may not be too high in order to avoid evaporation of light ends (optimal range: approx. 60-65ºC). Historically, steam flooding is among the first thermal stimulation methods used. The downside of that technique is huge heat loss into the rock mass and the formation of water-oil condensates at the well bottom that adversely affect permeability of the reservoir rock. Furthermore, this method is not suitable for shallow wells due to the potential risk of surge at the surface. Nonetheless, this relatively straightforward technique is fairly frequently used in the United States, Venezuela, Canada, Russia and Poland. 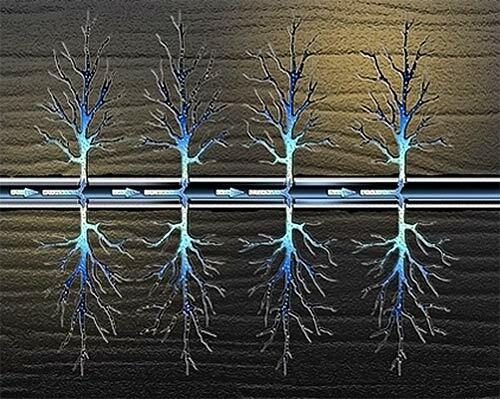 Electromagnetic flooding is a novel method wherein heat is generated by the flow of current, either by induction in the casing (the current does not flow through the reservoir) or by the current flowing between electrodes in the reservoir (resistance method). Reservoir rock must contain a certain amount of water to enable the flow of current. A horizontal well is frequently drilled out to act as an electrode. The reservoir is more efficiently heat flooded thanks to a larger surface of contact with the reservoir. 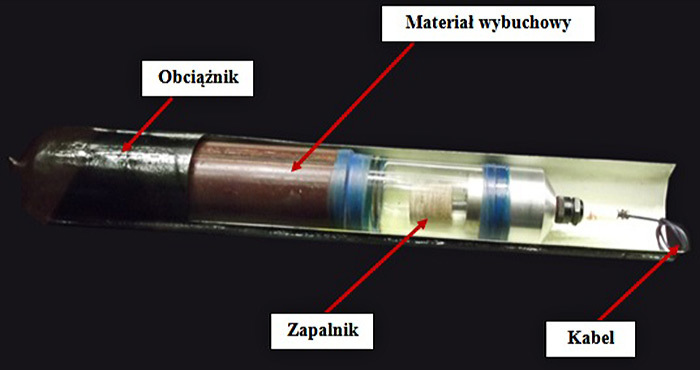 This technique has been successfully applied in highly viscous oil reservoirs in Russia, Brazil and Canada. In situ oil combustion is the last stimulation technique presented herein. It was first applied commercially in the United States in 1952. Following the success of that project, in situ combustion has been used in other countries around the world. It is intended to decrease oil viscosity by distilling light ends directly in the reservoir. At the same time, a higher reservoir pressure is produced (in English literature of the subject it is attributed to enhanced oil recovery (EOR) methods). The procedure consists of setting fire in a well into which air is injected to maintain combustion. The combustion front and light ends move towards the next producing wells. Comparing with previously discussed methods, the advantage of in situ combustion is that it covers a significant portion of the field, rather than just the near-well zone. On the down side are: loss of burned hydrocarbons and unpredictability of the process. Other techniques that are not discussed herein include: reservoir (rather than near-well zone) steam flooding, hot water flooding or hot air flooding. Stimulation techniques make it possible to increase the volume of hydrocarbon production, which is important considering the shrinking oil and gas reserves. They enhance commercial viability of production from marginal or heavy oil fields that are numerous in Poland. The development of stimulation techniques – from well shooting to hydraulic fracturing – enabled oil and gas production from unconventional accumulations such as the shale formations. Some of the techniques presented herein are of interest to historians only, but other will certainly be applied in that domain. Biały E., Kasza P.: O rozwoju stymulacji wydobycia w polskim górnictwie naftowym, Wiek Nafty nr 3-4/2011 (75), Krosno 05.09.2011r. The secrets of the gas production kitchen – how to make hydraulic fracturing successfully? What is the fate of a drilling site when the operations are over? What shale oil exploration and production methods are used? What shale gas production methods are used? How the well is abandoned when production or exploration activities are over?